The recurrent incidents of terror strikes have raised an alarm globally, compelling governments to explore technologies offering improved safety to their citizens. The rising cross border infiltration and growing fear of terrorism have created a market for products facilitating perpetual surveillance. As the situation surrounding global security worsens, the demand for night vision surveillance cameras is expected to rise, says TMR. The increasing demand for secured borders, secured living premises, and secured access surges, will in response bolster opportunities for the global night vision surveillance cameras market. As per TMR, the global market is likely to pace at an exponential CAGR of 26.5% between 2015 and 2024. Benefitting from the growing security concerns and demand for uninterrupted surveillance, the global night vision (IR) surveillance cameras market, which stood at US$22.8 mn in 2015, is expected to reach US$175.8 mn by 2024. Subsequent to the advent of latest technologies in the market, the price of night vision (IR) cameras is likely to fall at a significant rate. The market is also likely to gain from the increasing competition, as it encourages product innovation. The demand for night vision cameras is expected to increase in response to the rising construction of smart homes. These homes are in general integrated with technologies that enable to control and detect any criminal activities. Gaining impetus from demand for advanced protection of offices, homes, and properties, the global night vision (IR) surveillance cameras market is poised to surge exponentially. However, as online shopping makes inroads into lives of consumers, sellers are likely to emphasize more on aggressive pricing strategies. This could have an adverse impact on the market’s trajectory during the forecast period. Demand for night vision surveillance cameras is highest in the defense segment and the public sector. The recent instances of terror attacks on critical infrastructure, have brought their safety concerns at the fore. Banking, power, health, water supply, and communication systems have continued to remain at the target of sophisticated terror attacks. Any attack on critical infrastructure could make an economy highly vulnerable to further adversities. Ensuring their safety is therefore considered the foremost objective of any government. Proliferation of night vision (IR) surveillance cameras is therefore rapid across the public sector. Beside terror attacks, rising concerns related to natural disasters, accidents, criminal activities, and accidents have also resulted in the high market share of this segment in the market. 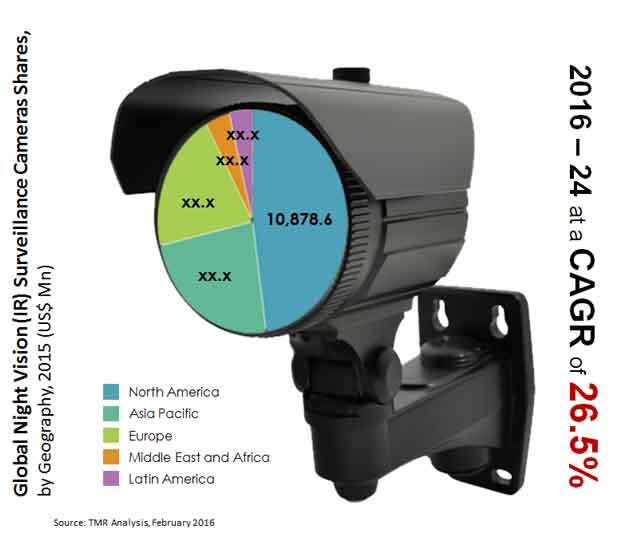 Regionally, North America has been exhibiting the most attractive opportunities for the global night vision surveillance (IR) cameras market. TMR projects the regional market to expand at a CAGR of 27% during the forecast period. The higher spending of developed economies in North America on public sector and defense provides ripe opportunities for the sale of advanced security devices. Other regional segments of the global night vision (IR) cameras include Europe, Asia Pacific, Latin America, and the Middle East and Africa. Among these regions, the sale of night vision cameras in Europe has been increasing at a robust pace. It is further expected to increase owing to the high demand for intelligent video in the region. Besides this, the increasing manufacturing of surveillance products in Asia Pacific creates substantial opportunities for sale of surveillance cameras in the region. Some of the most prominent companies operating in the global night vision (IR) surveillance cameras market include Axis Communications AB, Robert Bosch, GmBH, L-3 Communications Holdings, Pelco Corporation, BAE System Plc., and others. These companies mainly focus on product innovation and research and development to increase their profit margins in the market. This report provides an analysis of the global night vision (IR) surveillance cameras market for the period from 2016 to 2024, wherein the period from 2016 to 2024 comprises the forecast period and 2015 is the base year. Data for 2014 is provided as historical information. The report covers all the major trends and technologies playing a major role in the growth of the night vision (IR) surveillance cameras market over the forecast period. It also highlights various drivers, restraints, and opportunities expected to influence the market’s growth during the said period. The study provides a holistic perspective of the growth of the night vision (IR) surveillance cameras market throughout the forecast period in terms of revenue estimates (in US$ Mn), across Asia Pacific (APAC), Latin America (LATAM), North America, Europe, and Middle East & Africa (MEA). The report provides a cross-sectional analysis of the global night vision (IR) surveillance cameras market in terms of market estimates and forecasts for all the segments across different geographic regions. Night vision (IR) surveillance cameras are used for the purpose of surveillance in low-light conditions such as fog or in the nighttime, with the help of infrared technology. Some of the major applications of these infrared night vision cameras include continuous monitoring of critical assets, face recognition, threat detection, and traffic management. The demand for secured access, secured borders, and secured living premises, is a strong driver for the growth of the market for night vision surveillance cameras across the globe. Moreover, the growing fear of terrorism and increasing cross-border infiltration across critical national boundaries have created further demand for surveillance cameras, globally. Night vision (IR) cameras not only enable round-the-clock monitoring, but also keep unwanted elements away during the day and night. On the basis of shape, the night vision (IR) surveillance cameras market is categorized into box cameras, dome cameras, and bullet cameras. Night vision (IR) surveillance cameras market by type is categorized into fixed cameras and PTZ cameras. On the basis of end-use, the night vision (IR) surveillance cameras are segmented into public sector and defense, retail, transportation, industrial, stadiums, business organizations, and others. The report also includes competitive profiling of the major players associated with the night vision (IR) surveillance cameras market. Important business strategies adopted by them, their market positioning, and recent developments have also been identified in the research report. The companies profiled in the report include FLIR Systems, Axis Communications AB, Robert Bosch GmbH, Pelco Corporation, Raytheon Company, BAE Systems plc., L-3 Communications Holdings, Samsung Electronics Co., Ltd. and Hikvision Digital Technology Co., Ltd. Night vision (IR) surveillance camera vendors are focusing on increasing their market presence through strategic partnerships and the development of low-cost advanced solutions. Video analytics and intelligent imaging are the key focus areas of night vision cameras vendors currently.